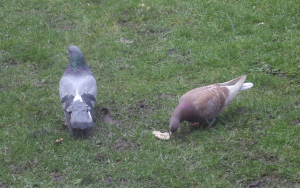 At home we normally see pure Rock Dove, see http://www.ispot.org.uk/node/2641, so interested to see these red-brown coloured ferals while visiting Yorkshire. There were seven feeding in the garden this morning all much like the red-brown one in the photographs. Does anybody known how they come to be brown - what bird have they inter-bredded with?